Stay on top of the latest news, events, resources, and happenings at JHU. The Blue Jay Family Flyer is published monthly and provides well-timed updates on student life, academic support services, family events, involvement opportunities, and much more. The Blue Jay Family Connection is published each semester by the Vice Provost of Student Affairs. JHU also communicates campus updates as needed throughout the year. Family members will automatically receive newsletters and email communication at the email address provided by your student on the Student Information System (SIS). If you are a family member of an incoming student, you will also receive the Blue Jay Family Welcome, a series of weekly emails during the summer leading up to your Blue Jay’s arrival on campus. Your student may add or update your email address on the Student Information System (SIS). “Like” us on Facebook to receive frequent updates on JHU happenings, events, and approaching deadlines. Winter break can be an exciting, joyful time, but it’s also time to check in with your student about how they’re doing, what they’ve been doing, and what they’re looking forward to in the spring. The Helpful Holidays Parents webinar presented by the Career Center and hosted by Ann Garner, Director of the Homewood Career Center, will help prepare for any conversations you might have about your student’s changing goals, their plans for their first summer, and making the most of their four years. 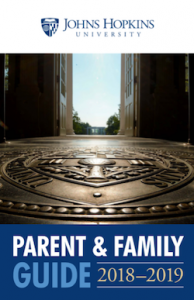 The JHU Parent and Family Guide provides a broad overview of the campus and relevant campus and community resources. We encourage you to contact Parents and Family Relations with questions or concerns. Please email or call us at (410)-516-7355 anytime! If you are interested in making a gift to the Hopkins Parents Fund, please email or call Parents Programs and Giving at (410) 516-3413.